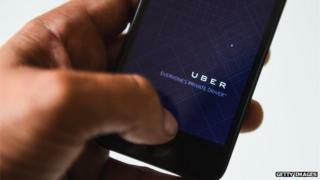 Car pick-up service Uber has had one of its services banned across Germany. It has emerged that the firm was told last week that its "low-cost" UberPop service could no longer take passengers and faced a fine if it continued. But an Uber spokesman said it had decided not to suspend the service, adding that the ban was not enforceable while an appeal process was ongoing. "Germany is one of the fastest growing markets for Uber in Europe," he said. "We will continue to operate in Germany and will appeal the recent lawsuit filed by Taxi Deutschland in Frankfurt. A check of the firm's software confirms that drivers continue to offer UberPop pick-ups in Munich, Berlin, Hamburg, Frankfurt and Dusseldorf. UberPop was launched earlier this year and involves drivers - who are not directly employed by the company - over the age of 21 using their own cars to transport passengers. Taxi Deutschland suggested that Uber could face up to a 250,000 euro ($327,840; £198,342) fine per trip if the American firm loses the case. The body described its rival as a "form of locust share-economy" indulging in "anarchy capitalism" that could leave passengers exposed in the case of an accident. "In Germany there's insurance that applies to private drivers," explained spokeswoman Anja Floetenmeyer. "But if your insurer learns that you are driving for an app and you want to make money on that, they say this is a multiple risk and refuse to [pay] insurance on that. "Uber doesn't care because security costs money. We don't believe it has the interests of [German] drivers and citizens at heart." But Uber's spokesman in Germany, Fabien Nestmann, has previously blogged that safety is one of his firm's key concerns, adding that "all the rides - and thus all travellers - are insured by Uber". The summary judgment follows a decision by London's transport authorities not to pursue a case against Uber in June this year. The company - which is backed by Google and the bank Goldman Sachs, among others - has been the subject of protests by taxi drivers in many European cities, including Berlin, Paris and London. Video Uber versus black cabs: Why are they arguing?